Imagine experiencing the world nose-first. That’s what it’s like to be a dog! Their smell is 1,000 to 10,000 times better than ours. Even if their sense of smell is good, they don’t always smell good themselves! 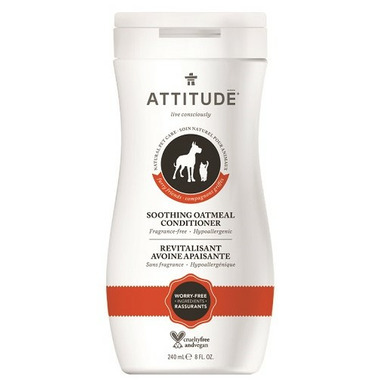 ATTITUDE’s Natural Pet Conditioners are made with worry-free plant- and mineral-based ingredients to take the funk out of their fur. The hypoallergenic formula is specially designed to remove odors, leaving your dog’s coat healthy, silky and smelling extra fresh. Directions: After shampoo, apply a sufficient amount of conditioner, work through fur, then rinse thoroughly.